Croatia is one of the most amazing sailing holiday destinations in the world. Places where you can find more than a 1,000 islands and islets on such a small area are extremely rare. In addition, summers are long, hot and sunny, and that can be translated into almost six months of sailing and swimming. Thanks to the great length of its coast, it will be impossible for you to explore all the wonders of the Croatian Adriatic in one go. You can choose to sail the beautiful northern Adriatic regions of Istria and Kvarner, more southern Zadar region, the popular Split region, and the magical Dubrovnik area. Whichever sailing route on the Adriatic coast you choose, you can be sure that your sailing journey in Croatia will abound in sun, tastes, scents, sights and sailing experiences. Our comprehensive guide on sailing in Croatia will give you the most detailed insight about the adventure you can expect once you hop aboard your sailing yacht. The best time to sail in Croatia always depends on your preferences, but it is still important to mention that the peak of summer/sailing season in Croatia is in July and August. If you would like to experience crowded cities, full marinas, bays full of boaters and all that fuss that summer is bringing, this would be the perfect time for you. When it comes to the regatta season, it starts at the end of April and lasts till the end of October. The largest number of regattas are held through April, May, June and September, October and November. The reason for choosing those specific months is very straightforward – the Adriatic winds. During these months the winds are stronger and more constant than during summer. There are still some regattas in the winter season (November and December) for the brave ones. Overall, the best time to sail in Croatia would be at the end of May and in June. The weather is favorable, the winds are constant and strong enough for decent sailing. Sea water temperatures are high enough for a nice refreshing swim, but the bays are not completely full, which means you will find some privacy. There will be no rushing into marinas to get a spot, since there will still be plenty of room even in the evening. You will be able to find some nice charter offers for June, since it is not yet the peak of the season and you will be able to save some money which you can use for a variety of fun activities offered on various islands. Once you decide to sail around the Croatian islands, there are a few possibilities of how to do that. The simplest way of getting on board of a yacht is to rent it. Renting a yacht without any crew members is called a bareboat charter and is it most common way of renting yachts in Croatia. Behind that fact there are a few factors. Croatia has very mild summers if we talk about storms. They are not frequent and do not last long. When you have more than a 1,000 islands in an archipelago, you can always find a shelter during the storm. Taking these factors into consideration, even less experienced sailors can sail very safely along the Croatian coast and enjoy it. If you are lacking sailing experience or you want a relaxing vacation without any worries, there is an option to rent a skippered yacht. The skipper will take full responsibility for the yacht, people on board, sailing manoeuvres and your itinerary. Our friendly recommendation would be to hire a domestic skipper because of his specific set of skills gathered on the Adriatic Sea and for his knowledge of local islands, customs, ports, restaurants, bays, beaches and all other information that is crucial for a perfect sailing holiday. A step further would be renting a crewed yacht, which includes a professional skipper and a host/cook. When it comes to larger yachts, there will also be a deckhand on board to help with all the ropes and mooring operations. When renting a crewed yacht, also make sure to hire a domestic skipper. Along with a domestic skipper, a domestic host can take you on tours on different islands and give you a short overview of their history and cultural heritage. If you choose to hire a domestic cook you will enjoy in the flawless Croatian cuisine accompanied by the best Croatian wines, some of which belong to the best wines in the world. On the Croatian coast, the most common type of a crewed yacht charter is a gulet. A gulet is a charming wooden sailing yacht and there is a large variety of Gulets offered in the Adriatic Sea. Most of them have a minimum of three or four crew members consisting out of captain, deckhand, host and a cook. Gulets are very wide, so you will feel very comfortable while spending time at sea. Among the offered gulets, you can find the luxury ones with all deluxe goods needed. Sail Week in Croatia is an event where you can book a cabin on a yacht or the whole yacht. If you do not want to be bothered with all of the organization issues, this is the best solution for you, since you will receive a “key in the hand” - the only thing left for you would be to pay the trip and show yourself on the yacht. Once you arrive to the marina, your yacht will be waiting for you with a professional skipper on board and with all the equipment needed. The organized sailing means that spots in ports and marinas are waiting for you, and same can be applied for restaurants and some other offered activities, resulting in providing extra value for the customers. The organized party sailing events usually include at least 10-20 yachts and at the peak of the season that number can reach 80 yachts, which sail all together in a fleet. Usually, it is quite of a melting pot, since you can encounter many nationalities from all over the globe. Most of the guests are young, from 20-35. So, if you decide to go ahead with this type of sailing, be sure you are ready to party! This topic is very ungrateful to write about, since costs can significantly vary and, for each person, the level of acceptable costs of sailing is different. The largest item on the list of costs is a charter yacht - it is up to you to decide whether to hire a brand new yacht with all the equipment available at the moment, or to hire an older boat with a soul for a pure sailing enjoyment. The second on the list would be marinas and port fees. ACI Marinas can be found in all regions of the Adriatic Sea and prices for a 45-foot yacht vary from €90 to €110 in the peak of the season. In all marinas and ports, fees are determined by the length of the yacht. In case you are sailing with a catamaran or trimaran, prices for the berth will be 25-100 % higher than for a sailing yacht of the same length. In most marinas you can dock just to refill your water tanks, and then you pay a fee only for the water. You will also find buoys on your sailing trip in some bays, and spending a night on the buoy will be charged by the length of your yacht, but that will be at least 50 % cheaper than staying in a marina. Some bays are under private concession, so once you anchor in such a bay, there is an anchoring fee which goes from €10 to €40, depending on the boat length. Almost every marina and harbour has its own grocery shop, but they are more expensive than the regular shops in the city or on the land, in case you are moored on the island. Also, more crowded marinas have higher prices in the shops, so stack your yacht at the beginning of your sailing journey. When it comes to food, it is very important to underline the fact that the guests are responsible for the well-being of the skipper and their obligation is to provide the skipper with three meals per day, and one of these meals has to be a warm meal. If there is a hostess on the yacht, the crew is responsible to provide food for the hostess too. There are fees for entering national park areas and some other protected areas. Some of the most famous ones are Kornati Islands (National Park), Mljet (National Park), Blue Cave, Biševo Island, Green Cave, Ravnik Island etc. Fuel costs are also significant - the consumption of fuel depends on the engine and the number of hours that the same engine has been used. Fuel costs vary from €70 to €200 per week, but as already mentioned, everything depends on your boat and sailing style. In case you are sailing with a catamaran, which has double the engines, count on double costs for the fuel. 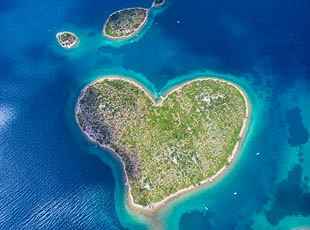 The Croatian coast and its islands are affected by the Mediterranean climate, which is characterized by rainy winters and dry, hot summers. The islands of Vis, Lastovo, Biševo and Svetac are in the category of most remote islands in Croatia, but what is more important is that they have the least precipitation of all Croatian islands, which means more sun. 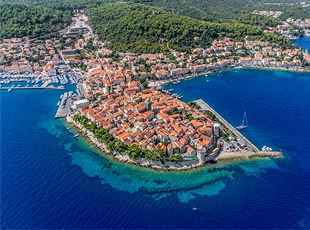 Among these islands, there are two absolute champions when it comes to the number of sunny hours per year - the islands of Hvar and Korčula which have more than 2,700 hours of sunshine per year. However, other islands are not far behind with approximately 2,000 sunny hours per year. Even though good weather and sunny days are common, you might experience something that Croatians call “Nevera”. “Nevera” is a sudden, strong but short lasting storm. Statistically, there is a greater chance you catch this kind of storm in the northern part of the Adriatic. Numbers say that during one month four storms appear in the southern Adriatic, while in the north, there could be six to eight storms in one month. Having in mind that storms do not last for a long time, you will have to find a shelter only for an hour or so, after which you will be able to continue enjoying your vacation. When compared to some European countries, Croatia has very negligible tide differences, resulting in no stress when it comes to leaving the port if the tide is about to arrive. You can leave the port whenever you like and whenever the weather allows you to do so. There are a few important winds you will surely encounter during your sailing vacation. The most famous wind in Croatia is bura or, in English, bora. Bora is a NE cold wind rolling down from the mountain of Velebit, and generating great speeds. In a way, bora can be very helpful - it clears the sky by blowing rainy clouds away. During summer months, it is not as strong as in the winter, but still you have to stay careful because of its constant shifts in velocity - the so called gusts. The fastest measured bora gust happened in winter 2003 with speed exceeding 300 km/h. On the opposite side we have jugo, a S-SE wind which brings rain and bad weather, and actually creates very large waves that can cause a very uncomfortable sailing experience. We also need to mention the best sailing wind in Croatia - maestral, a NW wind. It starts blowing around 10 a.m. and reaches its maximum strength between 2 and 4 p.m. The wind speed increases gradually, so it is very good for sailing. At the end of the day, its speed starts to drop, and by the dawn of the next day it gradually stops. For sailing in summer, you will need swimsuits, t-shirts, short pants and similar summer clothes. For nights, which are cooler and breezy, take a hoodie or a summer raincoat, which will be just enough - bad weather never lasts for long. In case you will be the captain of a sailing yacht, you should bring a sailing raincoat and water resistant pants along with rubber rain boots. In case of a storm, these three pieces will keep you dry. When sailing in spring and autumn, it is essential to have a sailing water resistant suit to protect you from rain, wave splashes and cold breeze. The weather may be great in which case you will not need it, but it is good to have it with you. How to choose where to go and what to do there? We will focus on the Adriatic coast and its islands. Without a doubt, the best way to explore and experience the Croatian coast would be to sail to all of its islands. However, that would be a mission impossible within a week or two considering that there are more than a 1,000 islands and islets. Each and every of those islands is more beautiful than the other and they all have their special charm. But hey, no worries! Here you will find an overview of the whole Adriatic coast and the best ways to sail through the area. More than 1000 islands - which one to choose? Let's start with a short division of the Croatian coast and its islands, so we can get a better overview of where to sail. A rough division would be Istria, North Adriatic, Dalmatia and South Adriatic. Istria is actually a large peninsula in the north-western part of the Croatian coast, full of small picturesque towns, where you can have a delicious home-cooked meal complimented with a great choice of local wines. In Istria, you will find numerous smaller islands and islets which are not inhabited, but still worth seeing and great for having a swim in their beautiful bays. One of Istria’s “must see” gems is definitely Brijuni. Brijuni is a national park consisting of 14 islands and islets, where larger ones are very rich with cultural heritage, flora and fauna. On the main island, there are many golf courses surrounded with beautiful landscapes - a heaven for golfers. The northern part of the Adriatic is a bit of a mystery for sailing beginners, considering the fact that most of sailing itineraries and schools are done in Dalmatia and the south Adriatic region. Nevertheless, north Adriatic is offering glorious landscapes, crystal-clear sea and remote islands with just a few inhabitants, where even the most demanding sailors will find peace and quiet. 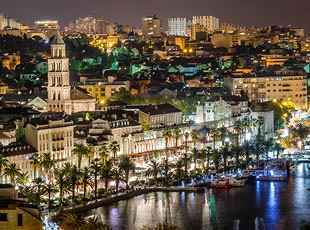 In the northern Adriatic you will find some of the largest inhabited islands in Croatia, which offer safe harbors and great restaurants. It is important to mention that the most popular party destination in Croatia - Zrće Beach, often called the Croatian Ibiza - is located here, on the island of Pag. The largest islands in this area are: Krk, Rab, Cres, Lošinj and Pag. Still, you should not miss visiting beautiful small islands like Silba, Olib, Premuda, Susak, Ist, Molat, etc. Dalmatia is the area around the city of Zadar, which has been rapidly developing its tourist offer in the past few years. Dalmatia is a part of the Adriatic Sea which boasts the greatest number of islands in Croatia. With Kornati islands archipelago, including 89 islands and islets, Dalmatia is already offering a lot to explore. There are still Dugi Otok, Ugljan, Kornati, Žut, Murter, Kaprije, Žirje, Zlarin and many more. Sakarun/Saharun Beach on Dugi Otok Island is a place you do not want to miss. From a nautical point of view, we could say that Dalmatia is the best sailing destination considering the density of islands in the region. When you are on the boat, there are just numerous islands as far as your eyes can see, and you will not regret visiting any of them. It is a nautical paradise. 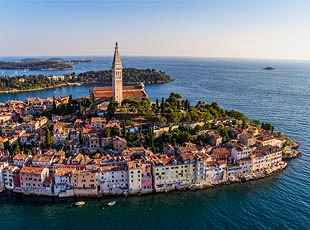 The South Adriatic boasts a group of larger islands with a greater number of inhabitants. There is also a group of islands which are pretty far from the mainland. That isolation gave them the opportunity to develop their special way of life, resulting in a very special charm which they are known for. One of these islands is Vis, which was actually a military island and due to that fact it was completely “separated” from the world and tourists for many years. While visiting Vis, be sure to visit the gorgeous Stiniva Beach. Another island is Lastovo - one of the most remote and inhabited islands in Croatia. More than 70 % of the island is covered by forests and its natural beauty has remained untouched. 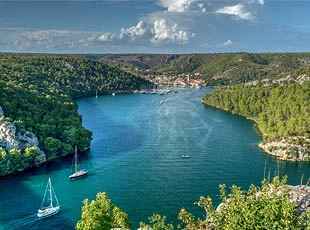 The island of Mljet needs to be mentioned as well, because of the fact that one part of this island is a national park. Some of the most popular islands in this area are Hvar, Brač, Šolta and Korčula. Hvar is famous for its crazy nightlife, but the island itself is also very rich in cultural and historical legacy. The city of Korčula on the island of Korčula is also known as the “small Dubrovnik” and is surely worth visiting. Distances between these islands are larger than in the north Adriatic and Dalmatia, so you will spend more time sailing, but that is what you love – so enjoy the journey. After reading this overview you will still have doubts of whether to visit the South, the North, Dalmatia or Istria. The most important thing is that you just cannot miss with neither of the sailing areas. All you have to do is book a yacht. In case you have time, book two weeks or more, so you have enough time to sail the whole Croatian coast and get the full experience of this amazing country.